1. Prokaryotes /Eukaryotes dichotomy and Bacteria/Archaea/Eukarya domains: two inseparable concepts.- 2. Phylogeny and Biodiversity of Prokaryotes.-&nbsp;3. 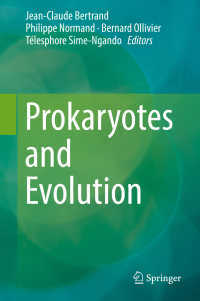 Importance of Prokaryotes in the Functioning and Evolution of the Present and Past Geosphere and Biosphere.-&nbsp;4.&nbsp; Evolutionary Success of Prokaryotes.-&nbsp;5. The Evolution of Living Beings Started with Prokaryotes, and In Interaction with Prokaryotes.-&nbsp;6. Evolution Underway in Prokaryotes.